1921 : une expérience ne lui suffisant pas, il recommence.. Cette deuxième génération se vendait en Sedan, Runabout et Sport Victoriade $17000 à $25000, c'était la voiture la plus chère des USA. Le moteur était un V12 construit par Weidely sur les spécifications de Heine. Cinq véhicules au total ont été construits: une Victoria, trois Sedan dont celle-ci et une Limousine qui ne fut jamais terminée. A remarquer que c'était les premières voitures américaines à utiliser les freins hydrauliques. ONE of KIND--1921 HEINE VELOX-LIMOUSINE!!!!!! Vehicle Description : 1921 Heine-Velox Historical Facts HEINE WHO? Not a household word, or even one commonly known by most car enthusiast, the Hein-Velox was created by a man who had no formal education beyond the fifth grade, and who?s ?real job? was a successful piano dealer. Gustav Otto Ludolf Heine was born on January 7, 1868 in Vierkrug, E. Germany. He came with his parents and his seven brothers and sisters to the United States in about 1873. The family settled in the Capa Valley of Northern California. At 16, Gustav decided to leave home, he went south to San Francisco and secured himself a job sweeping floors at the Bruenn Piano Company. Heine was quickly trained as a piano tuner, and within two years he became a partner in the company. Unfortunately Bruenn and Heine did not see eye to eye, their constant fighting left Heine with a scar from a tuning hammer and ownership of the piano company. The new owner re-named his business the Heine Piano Company. Not one to sit idle, Heine stayed up at night designing and inventing. Not all his creations were automotive in nature. He developed an energy saving system of warm air flues that ran from an indoor fireplace in his home outside to encircle and heat his long and narrow swimming pool designed so only one person could swim at a time. Sadly, the 0ne invention for which Heine is most known, is the one that was most unsuccessful. Early in the last century, he developed a new tire design that had bits of steel embedded in the tread. This tire proved to be a great danger, as it hurled steel at passerby?s if the automobile exceeded 25 mph. THE MAN AND HIS CARS THE EARLY YEARS Heine was a great lover of the automobile. He owned and raced cars, and engineered cars that brought new conveniences to the automotive industry. Heine claimed that his first car, an experimental buggy with friction drive was designed in 1888, but nothing much is known about this vehicle. In about 1904 Heine met E.J.Hall, who later became known as the famous Colonel Hall of Liberty Engine fame. Hall proved to be an important asset to Heine?s business. Hall designed specialty motors with hill climbing units that were a necessity in San Francisco. Hall worked for Heine for about 2 1�2 years beginning in 1905 and performed the duties of works driver, repairman, chauffeur, salesman and general partner. In 1904 what is known as the first Heine-Velox was introduced. It was a tourer with 35-40hp and a specially designed carburetor that heated the fuel before combustion, thus enhancing fuel efficiency. There were probably three cars produced in San Francisco between 1904 and April 1906, then on April 16, 1906 the San Francisco earthquake and fire destroyed both the factory and the piano company. Heine helped the federal troops by offering his services and the use of his larger tourer. He transported needed supplies, the wounded and the dead. His 1906 runabout had been stolen, and was later found after it had been driven without water or oil. Heine was able to fill the car and drive it across the bay to Oakland with little trouble. After some examination Heine found the crankshaft was in close to the same condition as it had been when originally installed. After the earthquake, Heine sold what was left of his car company and later that year went to Milwaukee to begin on a new model Heine-Velox to be produced in San Francisco. This 45-5-hp vehicle was promoted as being the most powerful car with the fewest parts for its weight and size in the world. Heine backed his claim with a $5,000 guarantee. In 1907 Heine was represented at the first big auto show in San Francisco at the new coliseum in Golden Gate Park. The Roy Mauvais Motor Company represented the Heine-Velox. Like Heine, Mauvais was a piano dealer who also owned an engineering and contracting firm. At the show, Mr. James Tyson, manager of the Charles Nelson Lumber Company of Alameda ordered a tourer model Heine-Velox. In 1908 production of the Heine-Velox?s ceased. The reason for stopping production is unknown, but because Heine had a very successful piano company he could do as he pleased. During the next 10 years Heine expanded his piano company and worked on various automotive projects. THE COMEBACK 1921 was the year Heine came back with the car for which he is best remembered. The 1921 V-12 Heine-Velox was created after Heine purchased the Economy Steel Manufacturing Company, fabricators of trailers and rolling stock. Heine used standard parts that he re-engineered to his own specifications and used a Weidely V-12 engine. January 1921 was the year the V-12 was first advertised. It was promoted as a luxurious custom-built car, with a price tag to match no other. The new Heine-Velox?s ranged in price from seventeen to twenty five thousand dollars. A very chic price tag, considering a fully loaded Rolls Royce was selling for fewer than ten thousand dollars. These cars were vehicles that showed off Heine?s innovative inventions and designs. They were a fantastic display of first in the automotive industry. Take notice: FOUR-WHEEL HYDRAULIC BRAKES: This car is considered to be one of the firsts, if not the first cars to use four-wheel hydraulic brakes in the United States. Some give credit to the Colonial Company, but who designed the system is not known. Some also believe that Heine, maybe with the assistance of Abner Doble designed the brakes, and spies from Chrysler took the idea back to Detroit. Another possibility is that Joseph Molinari; a young machinist who worked in Heine?s factory was the brake designer. And lastly, some surmise that Lockheed had some part in developing the hydraulic brakes, in fact, TRW produced an ad showing the Heine and claiming Lockheed?s involvement in its development. Featured in the Heine-Velox brake system was a five-gallon reserve tank under the dashboard that could be adjusted to refill either the front or rear brakes or both at once. Additionally, the brakes could be locked in position to inhibit theft. REMOVABLE TOP: The sedan models of the Heine-Velox were made in three sections, and were held together with clips. When the front section was removed the car had a town car or deville style with an open front seat. 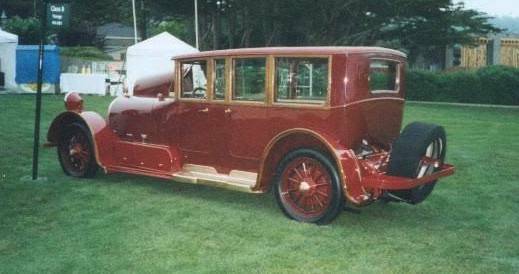 A landaulet was created with the removal of the rear sections. If the entire top was removed and a couple of the windows, the car became an open tourer. PIVOTING WINDOWS: Cars of the day had windows which operated in a vertical up and down motion and were either hand cranked or pulled up by a strap. The Heine-Velox windows pivoted. A ratchet-like device was used to operate the windows and they could be locked any position. It is said that Heine drove his car to Detroit to show to the Chevrolet people, and had to wait to see the head engineer. Heine was not one to wait, he told the shop personnel where the head engineer could go and he left, leaving his cat at the factory. Supposedly, Chevrolet came out with the wing window the next year, possibly an idea taken from Heine?s abandoned vehicle. RADIATOR: The radiator was, ?thirty degrees over radiated? so that it could keep a constant engine temperature in al weather conditions. GRAVITY OIL-FEED RESERVE TANK: An additional oil reserve tank was mounted under the dash with a gauge showing level of oil in the V-12, when the oil was low a lever could be pulled allowing the engine oil level to be maintained without leaving the car. CLEAR VISION WINDSCREEN: The windscreen was undivided giving a totally unobstructed view of the road. It was sealed all the way around the edge with a rubber to make it weather proof, and the ventilator at the top of the windscreen was designed so that dirt and bugs did not enter the car along with the fresh air. BODY CONSTRUCTION: The car body was attached to the frame on the side rather than the top. This gave the car more strength as well as gave it a lower center of gravity and a lower slung look. The Heine-Velox Engineering Company did all of the bodywork. BAGGAGE CARRIERS: The V-12 had the cargo space of a new recreational vehicle. Luggage carriers were place on the rear, the sides and the front of the car. A metal apron was attached between the two goosenecks in front of the radiator, which allowed the carrying of two bags without having to secure them on the car. The apron also aided in keeping dirt from the radiator. On the running boards there were small metal lockable boxes that could hold small hand luggage, and additional luggage could be secured on top of these boxes. A rack near the rear window was suitable for carrying a trunk, and to each side smaller racks could hold small pieces of luggage. On the sides of these racks were smaller carriers for umbrellas, canes or oil cans. THERMOSTATIC CUT OUT: This enabled quick start on cold mornings and was operated from the dashboard. 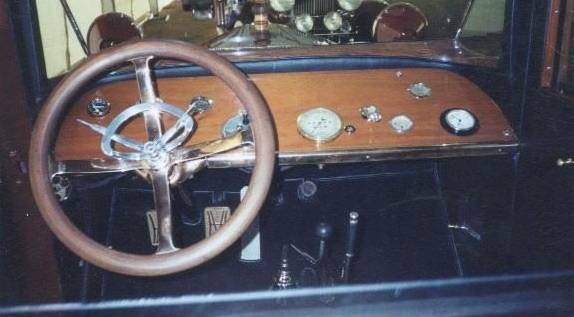 COMBINATION INSTRUMENT PANEL: Heine tilted the instrument panel forty-five degrees which he thought was more comfortable for the cars operator and it hid the ugly steering column. The gearshift and the hand brake were also positioned so that the driver did not have to lean forward. Underneath the instrument panel was a storage area with shelves. HEADLAMPS: The headlamps were set very high and far apart so as not to interfere with the driver?s line of vision. The mounting was on top of the fender, which eliminated the need for brackets, and gave the lamps more stability. The headlamps had both high and low beams, indicated by a reflector on the back of the lamps and operated by a vacuum switch. COMBINATION FOOTREST, EXTRA SEAT AND STORAGE COMPARTMENT: The rear seating area had two footrests, which could be adjusted to any length and could be lifted up into extra seats. Under the footrest-seats was a keyed storage compartment. TURN SIGNAL, SPEED INDICATOR AND ?HORN ENUNCIATOR? : In the rear of the car was a combination turn signal and horn. When a driver stopped, accelerated, turned or reversed the car behind would be made aware of these moves by the ?horn enunciator? and a light. There were other inventions, which Heine was not able to use because of possible patent conflicts, but many of the above extras were features that Heine was hoping to manufacture as accessories for other cars. He never patented any of them. He began the research, and for some he drew diagrams and petitions of patent, but never completed the process. Copies of some of these would be patents are available. Heine was a perfectionist. He road tested his car rigorously. He put thirteen thousand miles on one car in just a few months, driving across the desert or across a river on a barge. He took his cars apart and drove them with just the chasis. Heine?s daughter Ruth could be seen driving a chasis around town for her dad. On family trips Heine was constantly checking for the slightest noise or irregularity. Being a bit of an eccentric Heine stored the five V-12?s he manufactured shortly after the last one was built. A friend of the family who was a Hollywood actor sent Heine a check for $25,000 to purchase on of the cars, and Heine returned the check and wrote across the top,?We do not accept charity?. The check was for the proper amount, but for some reason Heine was not selling. Heine never sold any of the V-12?s, he kept some and have the others away. The Economy Steel Manufacturing Company closed in 1923, and so to did the production of Heine-Velox?s. Heine moved to southern California and pursued his interest in playing and composing for the piano, and purchased many different cars for his own amusement. As far as is known, Heine never designed another car. He did at his home on April 28, 1959 at the age of ninety-one years old. Vehicle Condition : As of this writing, none of the early types ? the 1888 experimental buggy, the 1904-06 models or the 1907-08 is known to be extinct. In all there were probably no more than ten cars produced in this early period. Heine did retain one of these early vehicles for a number of years, although nothing is now known of its fate. 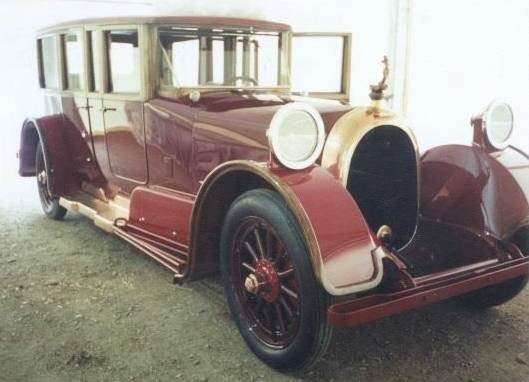 In the later V-12 period five vehicles were produced ? a Sporting Victoria, three sedans and one limousine. Four of these cars have survived. The Sporting Victoria was probably the most striking of all the Heine-Velox?s and in the opinion of Ruth Heine Dahl, (Heine?s daughter) it also rode the best. It was part of Harrah?s Automobile Collection in Reno, Nevada, and is now owned by Parker Wycham a Long Island, NY collector. The second and third vehicles, a sedan and the limousine, were stored a t Heine?s residence until 1953, when they were obtained by Louis D?Julio of Fremont, California. He kept them for twenty years and in 1973 sold them to James Brucker, Sr., of the Brucker Automobile Collection in Los Angeles. From 1976 the two cars were displayed at the Brucker?s museum, Movieworld Cars of the Stars in Buena Park, California. The museum and some of the cars were auctioned off in 1980 and the two Heine-Velox?s were put into storage in Santa Paula, California. Dennis Mc Cowan of Branford, Connecticut purchased the limousine. The front axle of the limousine was missing, as were parts of the headlamps and nameplates; the dashboard had few instruments. This car had never been on the road, since it displayed no wear, other than deterioration from age. The sedan has one of the removable tops that can be changed into any of three configurations. 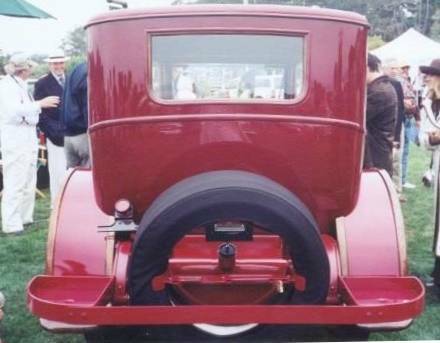 The fourth car, with the same removable top was given to Heine?s brother Fred, of Santa Rosa, California in the 1930?s. Fred was sickly and a clumsy driver so he gave the car to his sister Rosalie Heine High and her family soon thereafter. The High family found the car to unwieldy and left it out by a chicken coop, where Henry F. Straug, of Santa Rosa discovered and bought the abandoned treasure in 1973. Although the car had been out in all weather, it was basically sound, except for a missing radiator and shell; the top was gone too. Straub kept it until 1978, when he sold it to the present owner, a collector from Colorado. There are references to a possible fifth car that was either hit by a train or destroyed by a fire. One source says that it may have been a coupe, but others state that no coupe was ever produced. THE LIMOUSINE Downeast Moveableart acquired the limousine from the Mc Cowan?s in October of 1996. Restoration was begun by Kiwi Engineering(Greg Hunt), Final Finish(David Secor), and Hudson Valley Auto Interiors(Greg Georgi). Downeast conducted research and we found Mr. Wycham on Long Island. He had stored boxes of information from Mrs. Dahl,(Heine?s daugther) that revealed original glass negatives of the Heine Factory, documents on the car, copies of articles, patent worksheets as well as advertising worksheets. Kiwi Engineering was able to begin fabrication of the front suspension and the four-wheel hydraulic brakes. The Weidely V-12 engine was missing several parts and the crankshaft needed replacing. Downeast was able to acquire an additional engine from a 1921 Hal. This engine provided the necessary parts to restore one complete engine as well as the missing gas gauges. Nameplates, hubs and other missing parts were cast using samples from the SportingVictoria as guides. Research showed a padded leather top was missing. Hudson Valley Auto Interiors installed a new one, using three complete hides and following patterns showing the Heine-Velox emblem stitched into the top. All wood was replaced or refinished ? including the dash and the fender trim. Original cast copper running boards, radiator shell and trim were rebuilt, recast and polished as were required. The frame and body were restored and re-painted in an attractive period paint scheme. The wood artillery wheels were rebuilt using Stanley Steamer rims as patterns. The car runs great and is as powerful as any .Deusenberg of the era. Kiwi Engineering completely rebuilt balanced and blueprinted the Weidely V-12 engine and restored it to concourse condition.